Mini Handheld Fan, Gblife Portable Desk Fan USB Rechargeable - HOT DEAL! 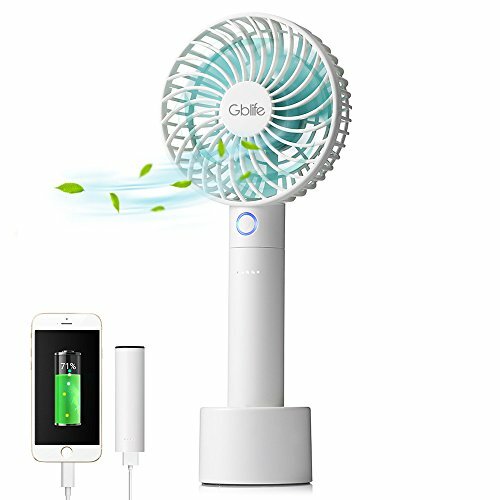 Mini Handheld Fan, Gblife Portable Desk Fan USB Rechargeable – HOT DEAL! ★ Strong Desk Fan: 6-blades table fan can work for 3-9 hours after fully charged, long-lasting. Strong air flow up to 29.5km/h. Designed with power indicator, charging base and USB charging cable, Convenient and easy to use. ★ 5 Adjustable Speed : There are 5 speed levels, easy to change the wind speed by pressing on the power button repeatedly. Can be continuously used for 9 hours at the lowest speed,3 hours at the highest speed. ★ Removeable Handle with Power Bank: Mini fan handle is a 2600mAh rechargeable battery, can be used as a back up power bank for your phone, Ipad, great for outdoor camping and hiking. ★ Extra Charging Base: Arrives with an advanced charging dock, it can help the fan stand firmly and can be used to charge the fan itself. Please make sure that the charging base is plugged with power source. ★ Lightweight & Portable: Only wights 0.51lb, lightweight and mini design, easy to hold in your hand or fit into your bag, you can take it anywhere and anytime without any hassle.